Today's post concerns the starting part of the bind off--the right edge. The next post will be about the ending part of the bind off--at the left edge. Let's say that our pattern requires us to bind off several stitches in the middle of our fabric, using the chain bind off. 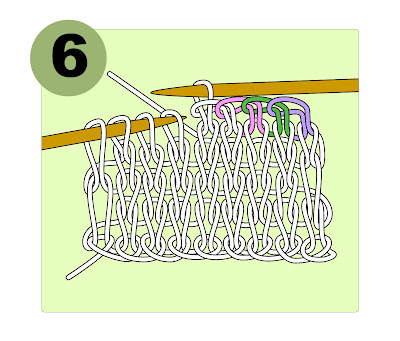 (Click here for further information on the basics of the chain bind off). First we'll look at the traditional method, and then the improved method. Illustration 1, below: Many books do not have any preparation step for binding off in the middle of the fabric. Rather, you are instructed to simply begin with an ordinary chain bind off as illustrated below: the last stitch of the fabric will be the teal stitch, while the first stitch bound off will be the purple stitch, which is being drawn over the green stitch. 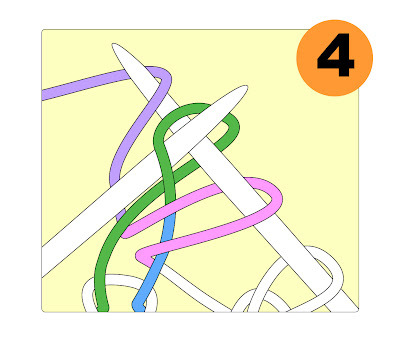 As you can see, the purple stitch is connected to the teal stitch by the little red tail, and we'll talk more about that little tail in illustrations 3 and 4, below. 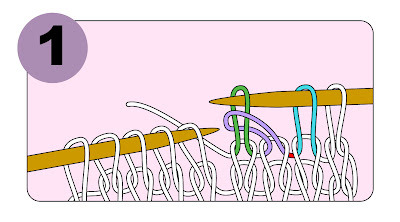 Illustration 3, below: As you can see, using the traditional method, the last fabric stitch (teal) and the first bind off stitch (purple) are connected by nothing other than a single strand--the tail yarn which connects the teal stitch to the purple stitch. This little tail (red) is going to form the bottom right corner of the bind off. Photograph 4, below: Here it is in real life, in all-purple yarn. The red arrow is pointing to the stretched-out single tail in the lower right corner of the bind off. To get rid of this ugly, weak gap, let's try this trick: instead of starting the bind off with the purple stitch, we'll do a little sleight-of-hand with the teal stitch. Remember that what we want to do is to improve the connection between the last fabric stitch and the first bind off stitch. As it turns out, when we use a kfb increase (knit front, back), the two daughter stitches which result are hooked together by a veritable spider's web of yarn. So, let's turn that fact to our advantage. We'll use a kfb increase and force the teal stitch to do double duty by turning it into the last fabric stitch AND the first bind off stitch. 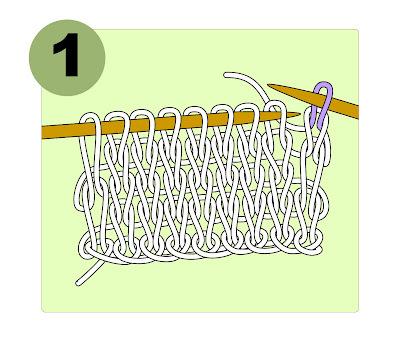 In this manner, we'll be able to position that strong connection between the two stitches just at the weak corner. In other words, in this improved version of the chain bind off, we are going to use the kfb increase to create TWO teal stitches--one to lay in the fabric, and one BONUS stitch, with the strong connection between these two stitches positioned at the weak corner. Per illustration 6, below, we'll begin our improved bind off by drawing the second teal stitch--the bonus stitch which we made--over the purple stitch, then the purple stitch over the green, and so on. Here is something important to remember about the teal bonus stitch: We do not COUNT it as a bound off stitch. Remember: the second teal stitch is an EXTRA stitch which we've created with only one purpose in mind: to put more yarn into that weak right corner of the bind off. Because we created it as an extra stitch, a bonus stitch, we do not count it when we get rid of it again. In other words, the second teal bonus stitch flashes into existence for only a brief moment: we create it, then draw it over the first stitch to be bound off, and then the bonus stitch is gone forever. It leaves behind only a stronger corner, but it never alters our stitch count. It is only when we draw the purple stitch over the next (green) stitch that we start counting our bound off stitches--the purple stitch, NOT the teal bonus stitch is the FIRST bound off stitch. Below, illustration 7, is a close up of what the improved corner looks like once we've add the teal kfb bonus stitch. As you can see, the corner which had only a single, weak red tail by the traditional method now has a sturdy spider's web of yarn fortifying the corner in this improved version. 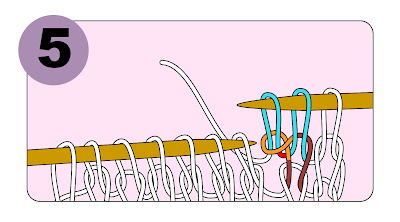 Instead of one strand of yarn, three strands of yarn lie there now--the two strands at the top of the bonus stitch's foundation stitch (orange) as well as the bonus stitch's own tail (illustrated in red). This construction will last far longer than the unimproved traditional corner of illustrations 3 and 4. Photograph 8, below: here is what the kfb looks like at the start of a bind off, in real life, in all-purple yarn. 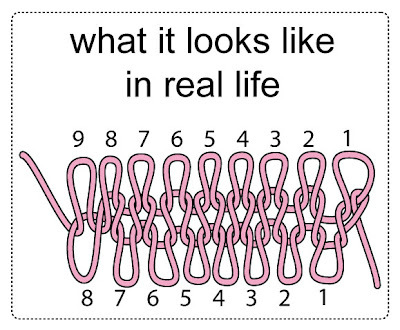 Although you can see the extra yarn in illustrations 5, 6 and 7, yet in an actual photograph (8) you can see that all these extra fortifying loops are actually hidden away, and all you see is the front of the bonus stitch. In other words, even though you've packed that formerly weak corner with lots of yarny fortification, the front presents a nice, even appearance instead of the the loose, sloppy and weak single strand in illustration 3 and photograph 4, above. I think you will find that over time, this little trick of fortifying the right corner of a bind off by starting the bind off with a kfb will pay off in sturdier buttonholes, more robust pocket openings, and easier to pick-up-through neck openings. One last thing--are you worried that adding an extra stitch to the corner will make the opening too large? In my experience, that won't happen. In fact, the tight twist introduced by the kfb will keep the starting (right) edge of the bind off tighter than by the original method, because you won't have a stretched-out mess in the corner there. Part 3: binding off circular knits. For today, ordinary stitch-over-stitch bind off along a straight edge--the top of a scarf; the neck of a sweater, for example. 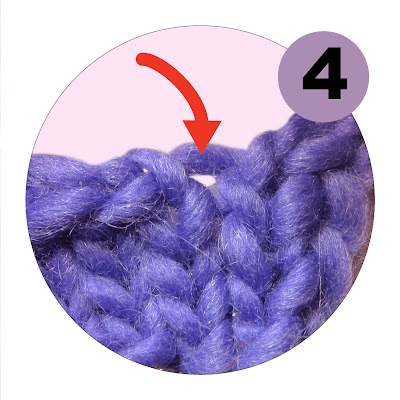 Step 1: Knit a stitch (purple) in the ordinary manner. Step 2: Knit the next stitch (green) in the ordinary manner. You now have two stitches on your right needle. Step 3: Insert the left needle into the first (purple) stitch on the right needle. Step 4: Draw the first (purple) stitch over the second (green). Step 5. Knit another stitch in the ordinary manner (pink). 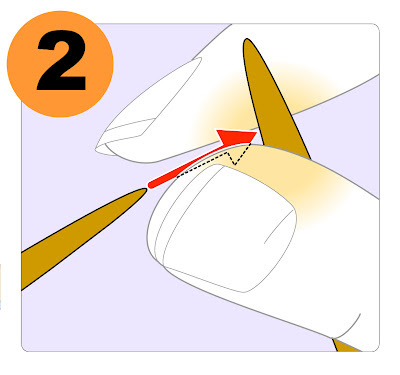 You will again have two stitches on your needle, just as in step 2. In other words, step 5 is the same as step 2. 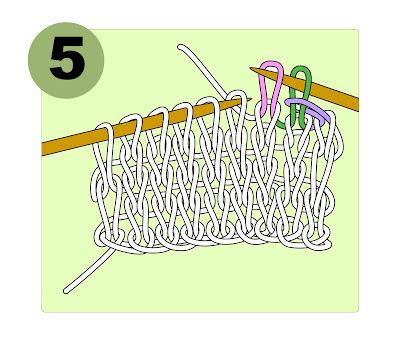 Step 6: Continue in this manner, repeating steps 2, 3 and 4 to create a bound off edge as shown below. 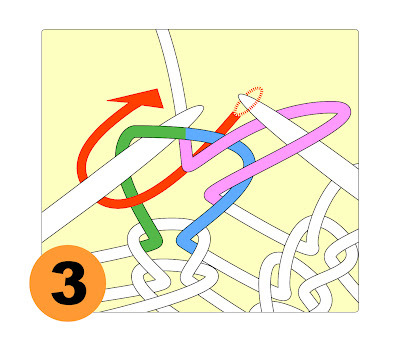 There are (at least) three ways to do the last stitch so as to avoid a great big loop at the end. Method a (below) Work to the end of the row as you have been doing. 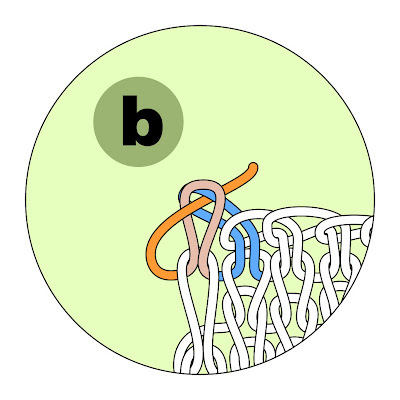 Draw the second-to-last stitch (blue) over the last stitch (tan), break the tail (orange) short, and thread the end through the last loop as shown. 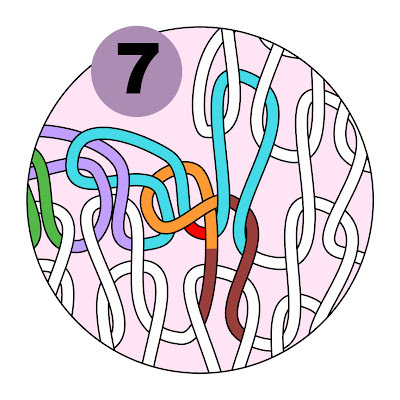 Draw up S-L-O-W-L-Y, feeding as much yarn as possible from the tan loop into the orange tail as you draw the tail up, in order to avoid that big loop at the end. Method b. (below) Work to the end of the row, but do NOT draw the second-to-last stitch (blue) over the last stitch (tan). 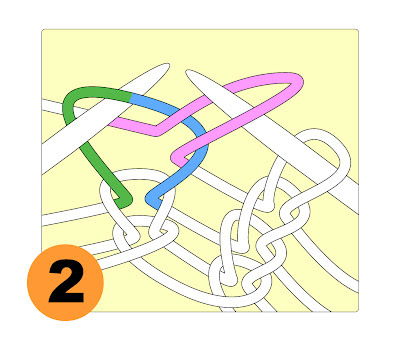 Instead, break off the tail (orange) and thread it through BOTH last loops, then draw the tail up. Again, be sure to tighten the orange tail slowly while feeding excess yarn from the last two loops (blue and tan) into the tail, in order to avoid having sloppy last loops. 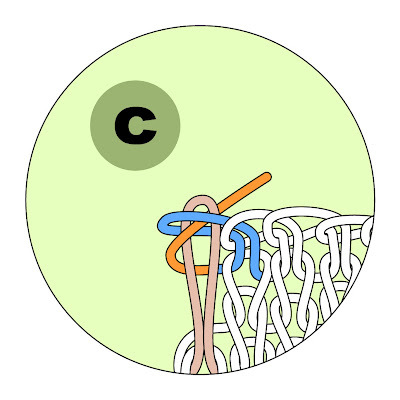 Method c. (below) Work to within one stitch of the last stitch. Do not knit the last stitch at all. Instead, draw the last (tan) stitch on your left needle up from the row below and draw the second-to-last stitch (blue) over it. In other words, do not knit this last stitch--which is the very edge stitch of your fabric--the "selvedge stitch." 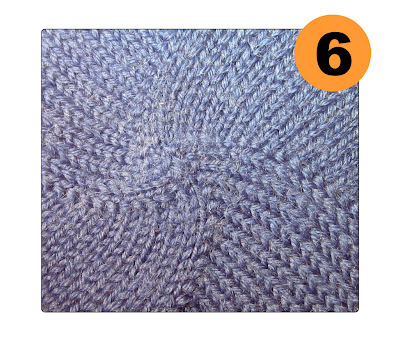 Instead, simply pull this (tan) selvedge stitch up, and then draw the second-to-last (blue) stitch over it. Break off the yarn and draw the tail (orange) of the yarn through the selvedge stitch (tan), as well as the second-to-last stitch (blue). 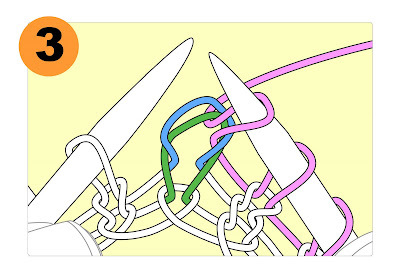 In this illustration the selvedge stitch (tan) is extra-long, because this knitter has been making a chain selvedge all along the fabric edge. However, a chain selvedge is not required to make this kind of ending--any sort of selvedge stitch will do just fine. Stitch-over-stitch chain bind off has the potential to be tight. If you want a loose bind off, such as at the edge of a scarf or afghan, or at the top of a sock, hat or at a mitten cuff, work this bind off with larger needles than you worked the item knitted. However, sometimes a tight, or at least, a firm, bind-off is wanted, such as at the shoulder seams or the back of the neck of a garment. A firm bind off in these high-stress locations prevents the garment from sagging, stretching and drooping. The stitch-over-stitch bind off is a good match for these situations. 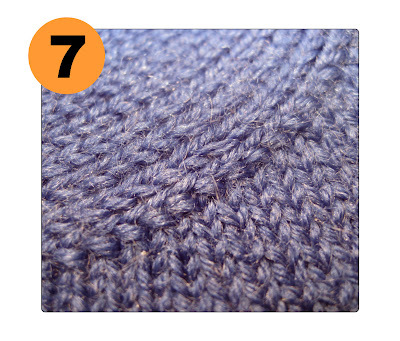 You have been reading TECHknitting on chain bind off (cast off). A review of the TECHknitting indexes shows that there are some techniques not yet illustrated, techniques which will be handy on the road ahead. As you can guess, knitting twice into the same foundation stitch causes this one foundation stitch give birth to two new daughter stitches, which is how this trick comes to be an increase. 1. (below) This is the "before" picture of the foundation stitch into which you will kfb. In the illustration, the front of the foundation stitch (the right arm, which lays forward on the needle) is blue, while the back of the foundation stitch (the left arm, which lays behind the needle) is green. The running yarn--which will become the first part of the kfb--is pink. 2. (below) The pink running yarn has been knitted in the regular knitting way, and now lays as a loop on the right needle. Note that the foundation stitch (half green and half blue) has not been slid off the left needle. 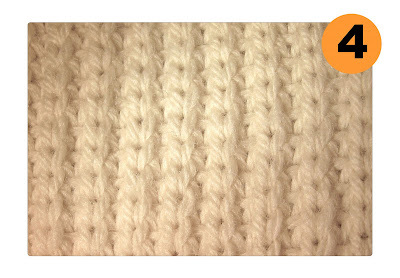 In other words, even though you have already knitted into the foundation stitch, you have only done the first half of the operation (the knitting into the front of the stitch) and therefore, the kfb stitch must remain on the left needle for the second half of the operation. 3. (below) The next step will be to knit into the back arm (the green arm) of the foundation stitch. The red arrow shows the path the needle must take. Specifically, you must swing the needle around to the back of the work, then down through the left arm of the foundation stitch, as shown by the arrow. 4. (below) As you see, swinging the right needle down and through the back (green) arm of the foundation stitch has twisted the foundation stitch into a figure "8," with the right needle through the TOP part of the stitch. Note that the bottom part of the foundation stitch is not twisted, only the top part of the stitch. Once you have the needle through the top of the foundation loop, the next step is to pull through the running yarn (now colored purple). 5. (below) Here is the finished kfb with the purple running yarn drawn as a loop though the back (green) arm of the foundation stitch. As you can see, the (pink) stitch through the front (blue) of the foundation stitch is drawn though the untwisted bottom part of the foundation stitch, while the (purple) stitch drawn though the back (green) arm of the foundation stitch is drawn through the twisted top portion of the foundation stitch--the twist having been made back in steps 3 and 4 when the right needle was inserted for the second time into the foundation stitch. 6 and 7. (below) Kfb has a reputation as an amateurish sort of an increase, but this reputation is undeserved. A regular series of kfb's looks very well, as the two final illustrations show. 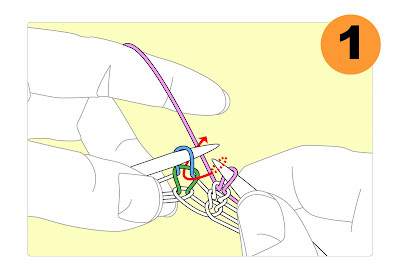 You have been reading TECHknitting on "knit into the front, knit into the back, abbreviated k1 fb or k f/b or kfb"
"My finger hurts from pushing back the left needle tip"
Have you ever given yourself a sore fingertip from pushing back the pointed end of the left knitting needle to bring up the new stitches to be knit? 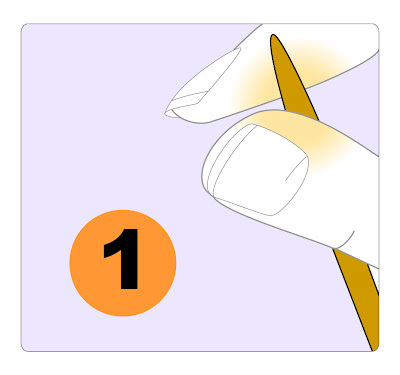 Many knitters use their right forefinger to push back the tip of the left needle (the one with the stitches about to be knit) as a way of delivering fresh stitches to the left needle tip. 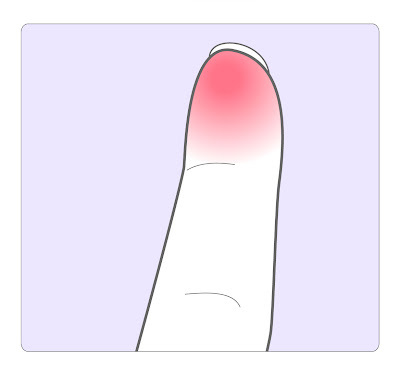 Some have gone so far as to split the skin of their right forefinger from the repeated jabs. 2. (below) Slide the left needle between the pinching fingers until the tip of the left needle touches the barrel of the right needle. 3. 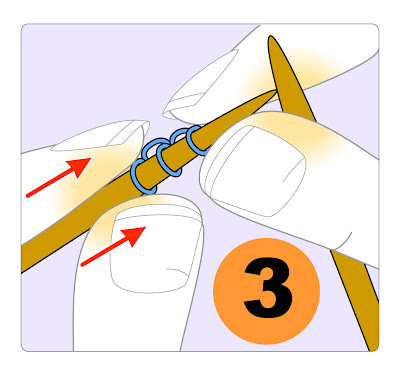 Bracing the left needle tip against the barrel of the right needle, pinch the left needle AND the stitches you want to slide with your left fingers (pinch indicated by light brown area) and push along the needle so the stitches slide towards the left needle tip. The left needle point won't go skidding off the barrel of the right needle, because the right fingers prevent that. Note that the right fingers aren't actually holding the left needle at all--they are only guiding the left needle while pinching the right needle. 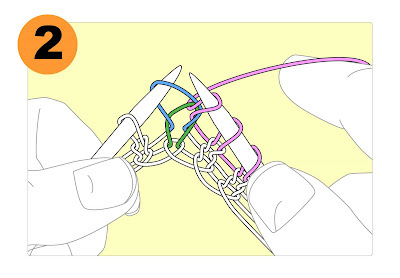 You have been reading TECHknitting on "how to prevent a sore finger when knitting"
CAUTION: There are TWO DIFFERENT METHODS SOMETIMES CALLED "KNIT INTO THE STITCH BELOW". The trick shown here makes a thick, cushy fabric, but is NOT an increase--it does NOT ADD any stitches to the fabric. The OTHER kind of "knit into the stitch below" is what I call the "nearly invisible increase." The nearly invisible increase DOES ADD a stitch to the fabric. 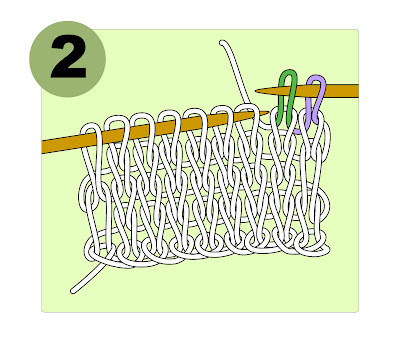 It is true that both of of these techniques involve the stitch below, but they are NOT the same thing. Confusing one for the other will cause no end of problems in trying to follow a pattern! 4 illustrations, click any illustration to enlarge. 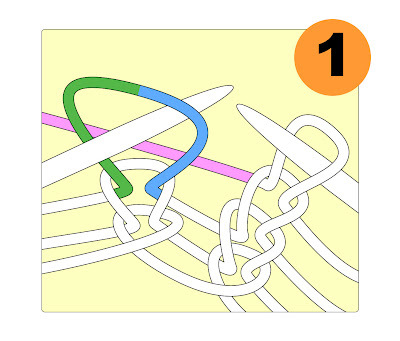 Instructions for various fabric patterns instruct you to "knit into the stitch below." Sometimes, the instructions are a bit more elaborate, stating something like this: "stab the right needle into the stitch below the next stitch on your left needle, knit that stitch, then drop it and the stitch above it off the left needle at the same time." 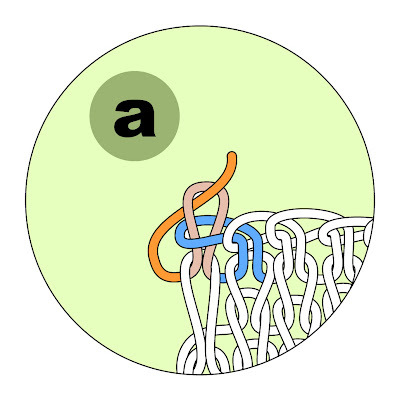 Diagram 1 (above) shows a continental knitter (yarn fed on off the left hand) but it matters not which hand feeds the yarn: in this stitch (like every knitting stitch) the path of the yarn through the stitch is the same for continental (left handed feed) and English/throwing style (right handed feed). 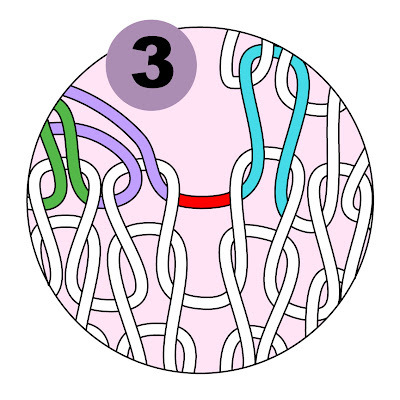 Step 2: The right needle has been inserted into the green stitch along the red arrow path of diagram 1, the standing yarn (pink) has been caught on the right needle and the loop of pink yarn, shown pulled through the green stitch, is about to become the newest stitch on the right needle. As you can see, the blue stitch (stitch above) has not yet been released from the left needle. Releasing the blue stitch is the last step in the process, because, by tensioning the blue stitch (stitch above) between the right and left needles while stretching the fabric downward with one or two hands, it is much easier to pull the running yarn (pink) through the green stitch (stitch below). Step 3: The blue stitch (stitch above) has been released and the pink loop is now officially a stitch, sitting on the right hand needle. Note the path of the pink yarn through BOTH the blue AND the green stitches. 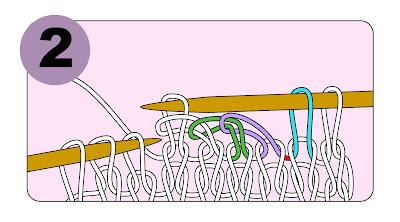 This is because the blue stitch, which has not been knitted, "runs down" one row until the pink yarn through the green stitch catches it and prevents it from running further. There are two general uses of this trick. First, it is sometimes used to get rid of a stitch--to park a stitch in the row below and get it out of the way. 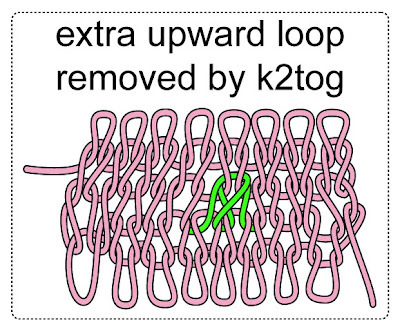 As an example, in the post of March 3, 2009, TECHknitting applies this technique of "a stitch in the row below" to improve binding off in the round (click here, scroll to third method). Another, more common use, is to make fancy, lofty stitch patterns similar to brioche stitches. 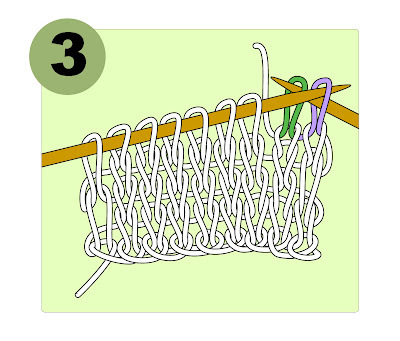 These sorts of "waffle knits" are cushier than ordinary knits: the technique of knitting into the row below draws up the fabric, making it shorter and thicker, as shown in Illustration 4, below. On the knit side (rows 2, 4, 6 and so on) *knit 1, then knit into the row below, repeating from * all the way across the row, ending with a knit 1. 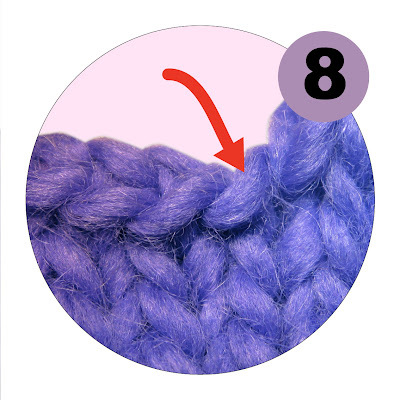 You have been reading TECHknitting on: "Knit into the row below," also called "knit into the stitch below." "When I unzip my provisional cast-on, why are there one fewer stitches going "down" than going "up," AND, what can I do about it?" Look at your hand. If you are like most people, you have five fingers. But how many spaces do you have between your fingers? 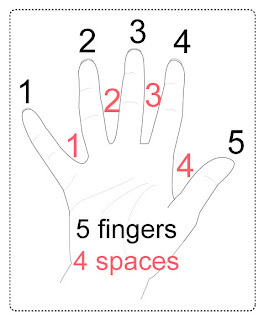 For 5 fingers, there are only 4 spaces between your fingers. The same thing happens in knitting when you work the other way from a provisional cast-on. If you cast on a certain number of stitches and work "up," when you "unzip" the provisional casting on, you'll have one fewer live stitches to knit "down." In other words, if you provisionally cast on 10 stitches and then undo the cast on, there will only be nine stitches waiting for you to pick up to knit "down." It's not a mystery--it's just the same thing as your fingers--ten stitches knitted "up" leave only nine spaces between them, and that's what you're picking up with the provisional cast-on--the nine spaces. Of course, the "spaces" analogy is not perfect--we obviously have loops on the needle, not spaces when we catch the live loops from a provisional cast on. 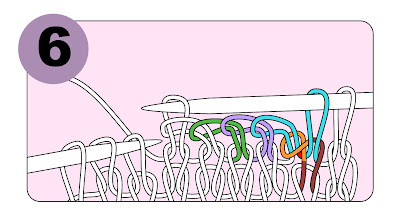 However, like the spaces between our fingers, these loops are the bars between the stitches, they are the stitch TAILS, not the actual loops themselves. Below is a view of what this would look like in real life if you removed the provisional cast-on, took the needles out, and could make the fabric lie flat. See that complicated business on the right and the loop on the left? 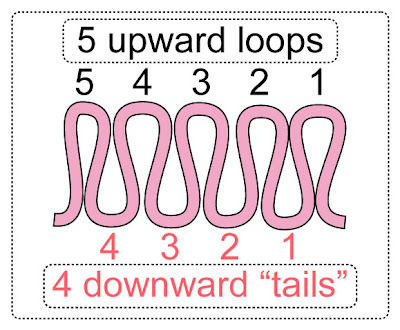 That's what happens when you pull out the provisional casting-on: The half loops of the rightmost and leftmost tails get pulled upwards to the next row, leaving only the full loops of the tails between the upwards loops: 5 upward loops make 4 downward tails, 9 upward loops make 8 downward tails. In other words, the pattern remains the same: always one fewer downward loops than upward loops. Let's say that you want to knit on 8 stitches. Try this trick: provisionally cast on 9 stitches. On the first and second row, knit all 9 stitches. On the third row, knit 2 stitches together (k2tog) where you think they'll be least obvious. In plain stockinette, see if you like the k2tog right in the middle, or if you find an edge less obvious. I vote for the middle of the row, but you must make up your own mind. On the illustration below, the needles and the provisional cast off have been removed, and the fabric has magically been made to lie flat. As you can see, the k2tog is in the middle of the row, picked out for you in green. There were originally 9 stitches cast on and worked "up," leaving 8 tails. However, after the k2tog, there are a matching set of 8 live loops at the top and bottom of this work. Row 1 and 2: Knit every stitch going "up"
Row 3: Somewhere along the third row, wherever you think it will be least obvious, k2tog to get rid of the extra stitch going "up." when the time comes to "unzip" the provisional casting on, you will have the correct number of stitches to knit "down." If the trick of REMOVING an extra stitch going "up" doesn't grab you, here's another alternative which has you ADD an extra stitch going "down." Provisionally cast on the correct number of stitches, and work all the stitches "up" normally. Unzip the provisional casting on, catch the live loops on your needle, and on the second or third row knitting "DOWN," add a stitch by the "invisible increase" method (click here for instructions). Knit every stitch going "up"
When you come to unzip the provisional casting on, you will find one fewer loops going "down." Pick up the stitches going "down" and knit for two rows. On the third row, add a stitch by making a nearly invisible increase. Provisional cast on makes a 1/2 stitch discontinuity--a jog-- between where the stitches go "up" and where they go "down." Not only is there always one fewer stitch going "down" than "up," but the offset between the tails and loops causes another problem, also. Specifically, when we knit "down" on the tail loops, the downward knitting is 1/2 stitch off the upward knitting. Through an act of heavenly mercy, it turns out that stockinette is so symmetrical that this 1/2 stitch difference is very nearly undetectable in stocking stitch. To prove this is so, take any piece of stockinette fabric, look at it closely, then turn it upside down and look again. You will see that stockinette looks the same upside down and right side up. The only way you'll see the offset in stockinette is at the edge of the fabric, where the 1/2 stitch jog shows as a tiny bump on each side. Other knit fabrics are not so forgiving. A continuous ribbed fabric would show a 1/2 stitch discontinuity between where the stitches are knit "up" and where the stitches are knit "down." To minimize this, provisional cast on is usually used along a border where the fabric pattern is going to change anyway: the classic location is at the border between the bottom band and the body of a sweater, or at the border between cuff and sleeve. Because the bottom band or cuff is likely to be made in ribbing, while the garment body or sleeve is likely to be made in a different pattern, the discontinuity -- the jog -- of the provisional pick-up line is disguised. A quick aside: Do you wonder why you'd want to put the cuff on a sleeve via a provisional cast on? There are at least two good reasons to do it: 1. It makes it easy to replace the cuff, important for children's clothing. 2. It makes it easy to adjust the cuff length after the main garment has been knitted and can be tried on. You might want to put the bottom band on a sweater via the provisional cast on method for the same reason: picking up the bottom band and knitting it last would make it easy to adjust the final sweater length after the sweater body has been knit and can be tried on. If you were making a garment with just one fabric pattern -- a pattern which would look bad with a jog -- you would have to arrange matters so that at the line of the provisional cast on, there would be several rows of plain stockinette stitch. 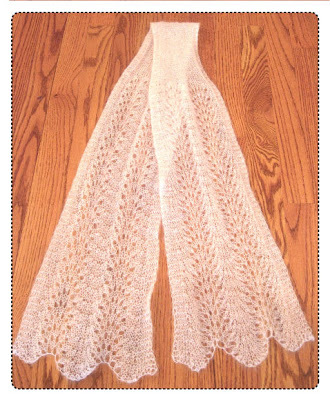 A common example is lacy scarf worked in a directional lace pattern. 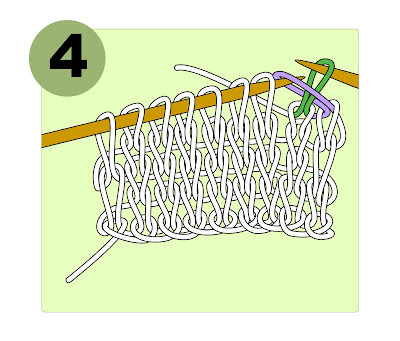 Specifically, in order to have the two lace patterns match at the lower ends of the scarf, you might want to start the scarf in the middle with a provisional cast on, and work first towards one end, and then towards the other. 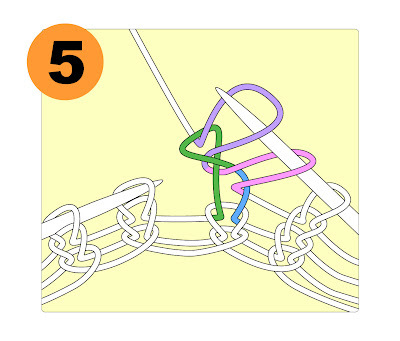 However, you might not want the 1/2 stitch jog to interfere with the continuity of your lace pattern. A classic solution is to design the scarf with a stockinette panel, as shown below. Because the provisional cast on is in the middle of a stockinette fabric, there will be hardly any visible discontinuity where the provisional cast on lies--there will be a 1/2 stitch jog at the edges, but none in the middle of the fabric. Also, the shape of a scarf with a narrow stockinette pattern lies very well on the neck--the narrow bit goes around the back, adding no bulk behind the neck, while the pretty lace panels show in all their glory on the front. The best part about a scarf like this is that the narrow stockinette band has the same number of stitches as the lace panels--no increasing is required. The secret is that lace (pretty nearly any lace) is much wider than a stockinette fabric on the same number of stitches, due to all the yarn overs. You have been reading TECHknitting on: "Provisional cast on --one extra stitch going up, one less stitch going down; 1/2 stitch off in pattern"
As must be obvious, there is no tech editor at Chez TECHknitting. Accordingly, this blog sometimes gets disorganized. I thought we were heading for garment shaping, I've even knitted up a bunch of samples, but when it came time to write and illustrate all the tricks in the shaping, it turned out that there are still lots of techniques to cover first. Accordingly, I've axed the previous post with its false promises about socks and garment shaping. Regardless of whatever was stated earlier, this blog simply hasn't progressed as far as garment shaping: not socks, not sweaters, not yet. Instead, for the foreseeable future, TECHknitting will be taking up the old torch again and concentrating on the TECHnique of making knitted fabric. Specifically, we'll start tomorrow with a post concerning provisional cast on--what to do about the fact that when you take out the provisional cast on, you'll have 1 less stitch heading "down" than you had heading "up."